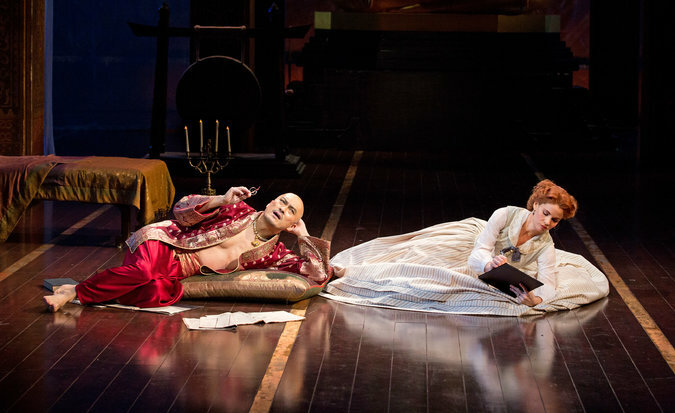 The reviews for The King and I are in, and the critics universally admire this astonishing revival. Playing at the Vivian Beaumont Theater at the Lincoln Center, this sometimes touchy standard is here crafted by the deft, thoughtful hands of director Bartlett Sher. Instead of hiding behind or overemphasizing the seemingly out-of-touch themes of the musical, Sher builds a world of openness and clarity, one where the story and its innate messages somehow ring as truthfully and broadly as ever. The production is at once lavish and large and intimate and honest, thanks in part to creative collaboration with Catherine Zuber (costumes) and Michael Yeargan (set), comrades from Sher’s 2008 South Pacific. The cast is led by the stunning Kelli O’Hara who wins hearts and makes the tale all the more compelling. Ken Watanabe also plays a winning turn as the King of Siam, complete with an authentic language barrier at times. Truth be told, there are dozens of reasons to add The King and I to your shortlist. Simply don’t miss it. The truths about Anna Leonowens and King Mongkut are even more fascinating than the musical: she was a mixed race British/Indian girl whose masquerade as English gentry took flight with the death of her Anglo-Irish husband, while the king had avoided assassination by spending 27 years as a Buddhist monk, begging his food around the entire country before he became King. You can read more about the adventures and conflicts of the real Anna Leonowens and the real King Mongkhut @ Sakkiselznick123@blogspot.com.